The thermal baths of Les Bains du Val d’Illiez offer a relaxing day spa excursion from Alpine ski resorts in the Valais mountains or an easy day-trip destination from Lake Geneva towns. 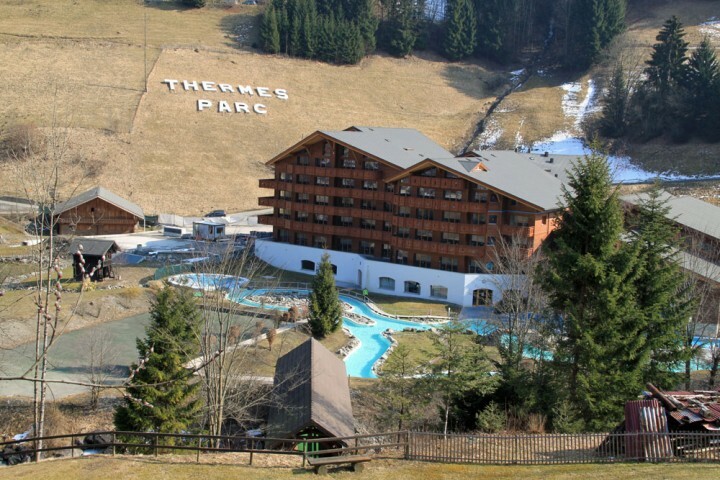 The Thermes Parc Les Bains du Val-d’Illiez is a relaxing mineral hot water spa resort with warm baths, saunas, Jacuzzis, jet streams, steam baths, and day-spa treatments and massages. 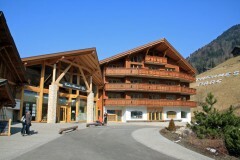 The spa baths are beautifully located in the Illiez Valley, an easy drive from the Rhone Valley, Lake Geneva, and several Portes du Soleil ski resorts in Switzerland and France. Several restaurants and an apartment hotel are available on premises. The thermal baths of the Thermes Parc Val d’Illiez is a modern day spa with hot water baths and the regular range of massages, beauty and wellness treatments. The facilities are modern but the concrete and steel constructions are mostly wood-clad in the beautiful traditional style of Illiez Valley architecture. The thermal baths at the Val d’Illiez Thermes Parc are around 34°C and include a large covered bath in the main hall, a smaller outside pool linked by river to the indoors area, and a large exterior bubbles bath. All the main baths have a range of Jacuzzis, bubble beds, and massage jet streams. A 200-m river is fed directly by the mineral source – the 30°C water is surprisingly cold on a winter day when just arriving from one of the warmer pools but feels pleasant fast enough. The sulphuric smell lingers longer. Further water features in the park are open during warmer weather. The Iliez River flows through the park and this Alpine stream is of course very cold in comparison to the baths. The sauna, tylarium, and hammam (steam bath) area is only open to adults and require an additional small fee (CHF3 per day). Visitors are not allowed to bring food and drinks into the thermal baths area; however, many picnic areas are available nearby. A small snack bar can be accessed directly from the baths. In addition to snacks and sandwiches available during the opening hours of the pools, pizzas are also served during meal times. La Bergerie, a typical Swiss chalet-style restaurant is adjacent to the thermal baths complex but cannot be accessed from the bath area itself. It also has wine bar and acts like a tearoom outside meal times. The thermal park complex is surrounded by several large six-story chalets with apartments ranging from studios to 5-room flats for hire or purchase. 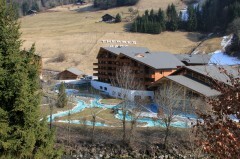 A hotel will opened in 2012 in the building next to the main thermal pool area. These buildings are in the typical style of the valley with wooden balconies and overhanging roofs. The thermal baths spa complex is open year round from 10 am to 8 pm (9 pm on Friday and Saturday). Admission for three hours is CHF22 for adults, CHF15 for children 4 to 15, or CHF66 for a family of four. Children under 4 are not admitted to the pool complex. The admission ticket is in the form of a small watch-like wrist band, which is also used to access the lockers. Towels, bathrobes, and slippers can be rented but very few visitors bother with the latter two. 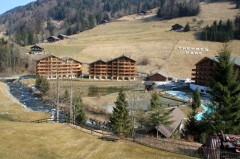 Getting to the Thermes Parc Les Bains du Val d’Illiez is easy by car or public transportation. The baths are some way up in the mountains but not nearly as high as say Leukerbad or Ovronnaz. It is an easy 15 km (20 minutes) drive from the Monthey / St Triphon exit of Autoroute A9 in the Rhone Valley floor to the baths – follow signs to Champéry and then the brown Les Bains u Val d’Illiez signs. Passengers will appreciate the 50 km/h speed limit that applies to much of the road, which makes for a comfortable ascend. Driving times to Val d’Illiez are from Geneva 1h20 (120 km), Lausanne 0h50 (60 km), Bern 1h30 (120 km), and 0h50 (60 km) from Sion. By train, change in Aigle from the mainline in the Rhone Valley to the small mountain railway heading to Champéry. The mostly hourly train takes around 45 minutes from Aigle to Fayot, the small station right above the thermal baths. The train only stops at Fayot on request (sur demande) – press the button as on a city bus. (Fayot is the stop in between Val d’Illiez and Pont de Fayot.) 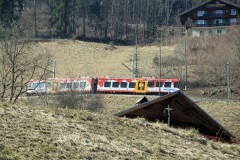 See Swiss Railways for timetables and tickets. Traveling time by train to Fayot is around 2h20 from Geneva, 1h20 from Lausanne, and 2h30 from Bern. The Val d’Illiez is low on formal sights but visitors will enjoy the special traditional architecture, lovely typically Swiss villages, and beautiful nature. A visit to the valley also combined well with visiting the picturesque and historical Chateau d’Aigle with its winemaking museum. See also Top Hot Water Springs Resorts for more thermal bath resorts and day spas in the Lake Geneva region.